Learn how to exploit your AS/400 integrated network security functions. Today, network administrators face the challenge of implementing layered security architectures to protect their networks from the increasing sophistication of "hackers". To provide all of the security needed within a manageable budget is a complex task. 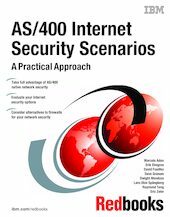 This IBM Redbooks publication explores all the native network security features available on the AS/400 system such as IP filters, NAT, VPN, HTTP proxy server, SSL, DNS, mail relay, auditing, and logging. It describes their use through practical examples. Although OS/400 is not intended to be a firewall, the correct implementation of its rich set of network security services, combined with routers or other Internet security appliances, may eliminate the need for a separate firewall product. In some cases, it can provide an affordable solution for smaller sites. The AS/400 network security functions can be used to enhance the security of environments where routers with firewall security features are also used. This book is designed to meet the needs of network administrators, consultants, and AS/400 specialists who plan to design, implement, and configure AS/400 networks connected to the Internet and are evaluating alternatives to traditional firewall products.